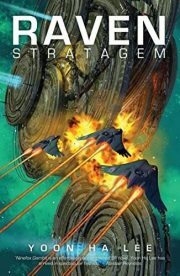 2017’s Raven Stratagem is the second novel in Yoon Ha Lee’s Machineries of Empire series. 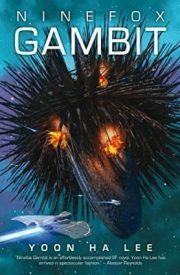 The first novel in the series, Ninefox Gambit, was reviewed here. 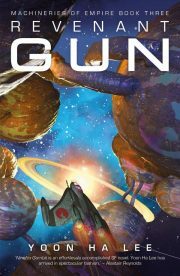 Readers are well advised to read Ninefox Gambit before reading Raven Stratagem. The Hexarchate is far too sensible to rely on the obedience of soldiers with free will. Instead, every soldier of the Kel has no choice in the matter, thanks to formation instinct conditioning. To see a superior officer is to be compelled to obey them. It’s a system designed to make mutiny impossible. For the person wearing senior officer Cheris’ body, it means that taking control of the Swanknot shipswarm is merely a matter of establishing that they are the undead General Shuos Jedao. Once they believe they are confronted with a general with three centuries of seniority, the hapless soldiers have no choice but to obey. By the time the Hexarchate’s rulers discover what Jedao has done, he and his little fleet are long gone.